In this fast-paced world, it’s often easy to forget to take care of ourselves. 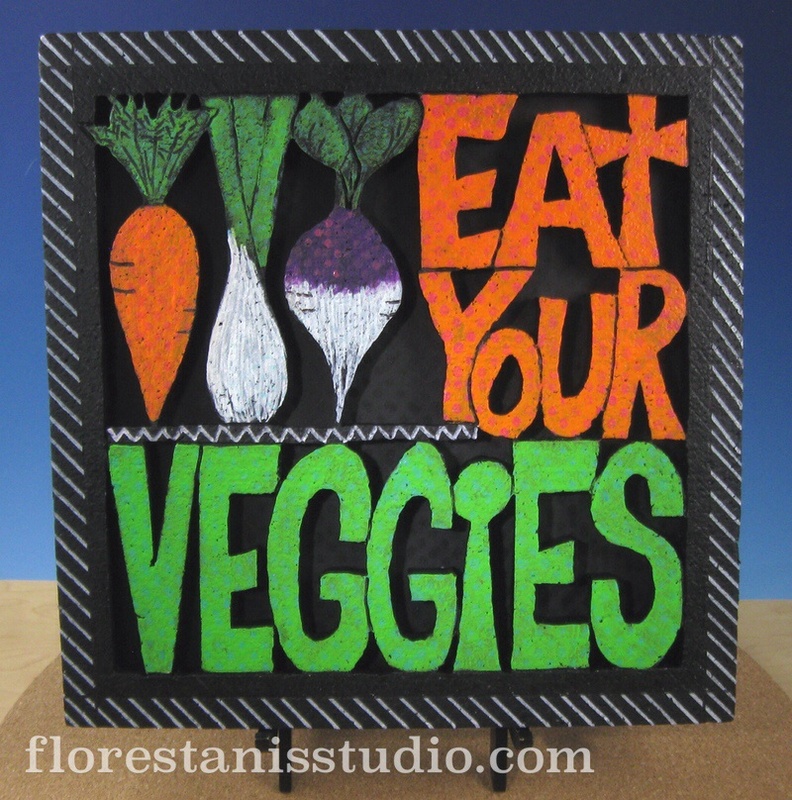 I made this carved Smoothfoam panel as a cheerful reminder to eat healthy. Now I just have to remember to buy fresh vegetables and not just lovely fun crafting supplies! 1. Click here to download* my artwork. Because the design is too large to fit on a single sheet of Sulky, I tiled it on two pages. 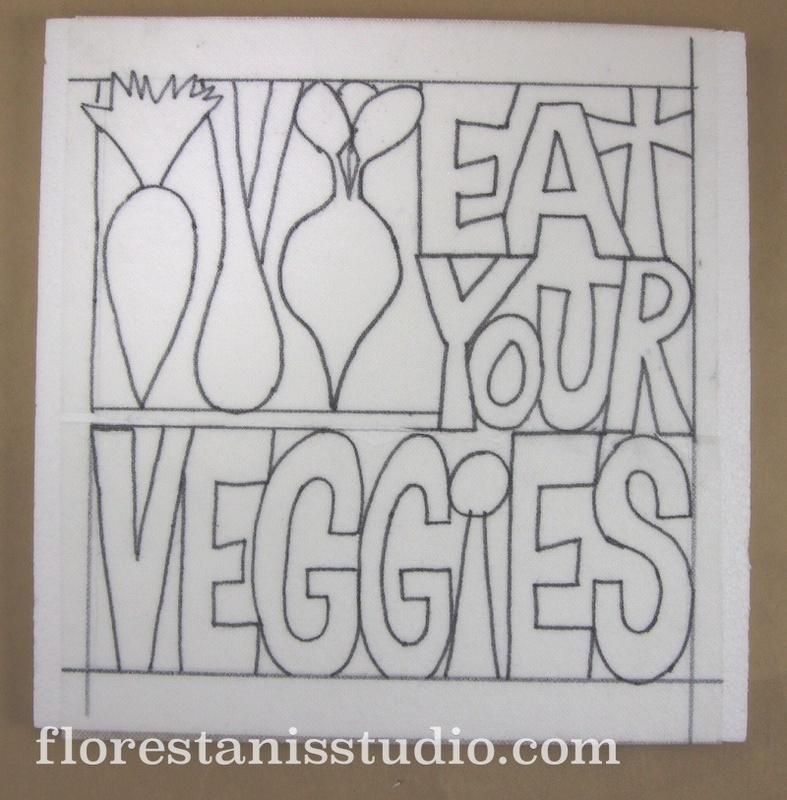 Print the artwork on to the Sulky Stick’n Carve Printable Transfer Sheets. Peel off the backing release paper and apply the Sulky sheet pieces to the Smoothfoam block, overlapping to make one continuous design. Trim off the excess transfer sheet. 2. Use the Hot Knife tool to poke a pilot hole in the Smoothfoam sheet in each area which will be cut out. 3. Carefully carve out the Smoothfoam sheet with the Mini-Scroll Table. You will need to unthread and insert the wire into each pilot hole to make each interior cut. 4. 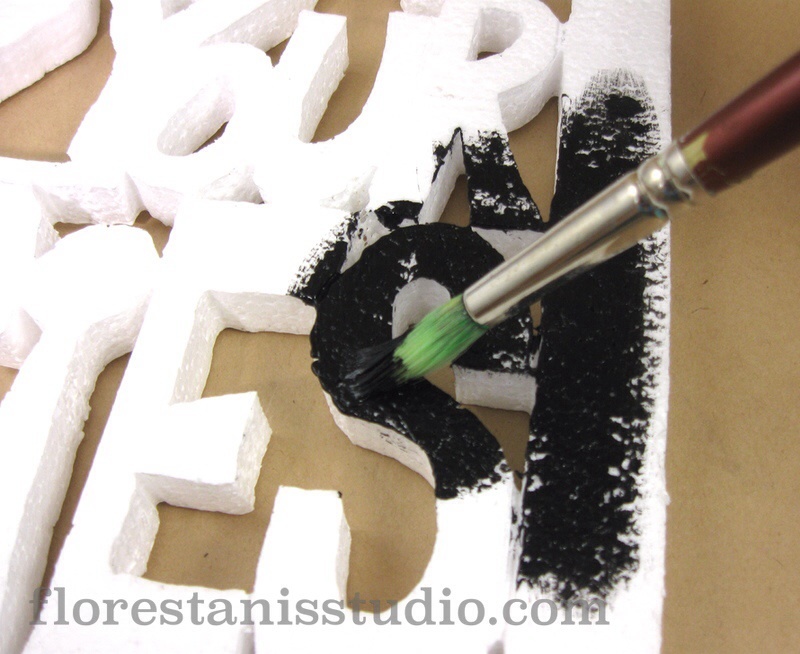 Use the Engraving Tool to carve details into the foam. Peel off the transfer sheets when finished. 5. Paint the Smoothfoam black. Let dry before painting the carrot and the words “Eat Your” orange. Paint the onion and turnip bottoms white. Paint the vegetable leaves and the word “Veggies” green. Paint the turnip top purple. 6. 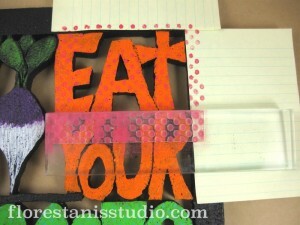 Stamp the orange letters with the Dots stamp and Berry ink. 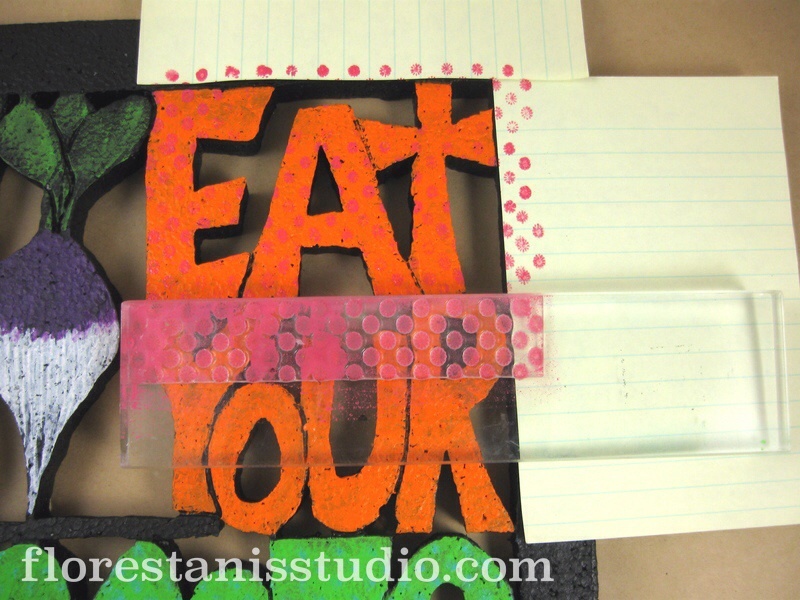 Use paper scraps to protect the areas you don’t want to stamp. Stamp the green letters with Aquamarine ink. Stamp the vegetables with Lilac and Tangelo as shown. 7. Add details with the paint pens as shown. 8. Stamp the foam core square with black ink. 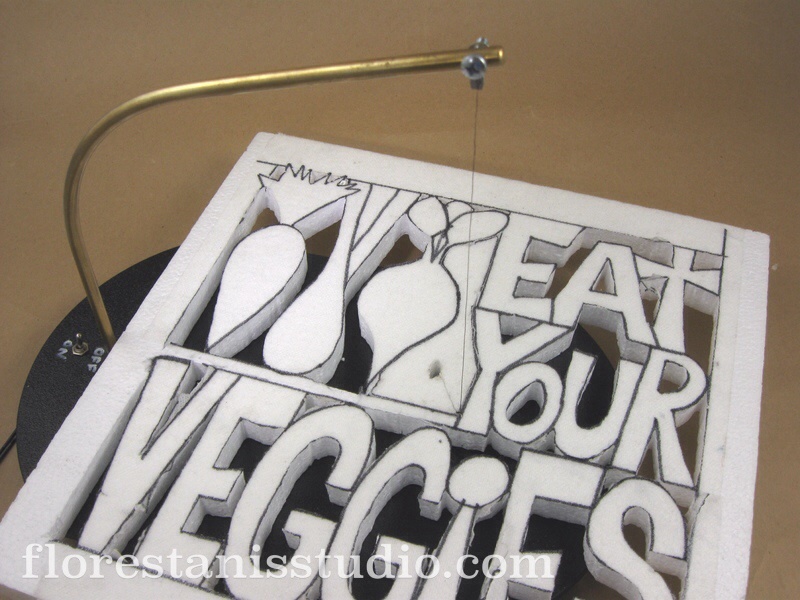 Glue the carving to the foam core and glue a picture hanging hook to the back or display on an easel. * Copyright: You are welcome to use my original artwork only for your own use or for a gift/donation. You may not use my designs for items intended for resale. This entry was posted in General Crafts, Special Techniques and tagged Green, Orange, Sheet, Sign by Carmen Flores Tanis. Bookmark the permalink. Carmen Flores Tanis is a mixed media artist, crafter and designer who loves to make things! She specializes in combining humble materials in unusual and unexpected ways. A Designer Member of the Craft and Hobby Association, Carmen has on online craft supply store and teaches craft classes regularly in Southern California. Her secret to crafting happiness is "patience, practice and power tools."